Our posture correction with chiropractic treatment has helped many improve pain and posture. Contact us for a healthier posture. Is it possible to Correct Posture Corrections with Chiropractic Treatment? Get the best posture correction with chiropractic treatment at Chiropractic Specialty Center® today. Yes, posture correction is possible through chiropractic treatments. Before going in-depth into chiropractic treatment for better posture, let’s go over posture. Posture is defined as the position you hold when sitting, standing or lying. Having good posture improves your body’s ability to resists musculoskeletal distress. In other words, your spine and joints will be able to withstand the stresses of daily living. Our daily life involves sitting for prolonged periods. Sitting and inactivity lead to muscle and ligament weakness. These weaknesses, in turn, will impact our ability to stand erect. Also, weak muscles will hamper your ability to sit in a correct neutral position. In short, our modern lifestyles are the main reason why so many have poor postures. The good news we can share is that poor posture is reversible. Yes, it can be corrected. In some cases, patients may need targeted chiropractic and physiotherapy treatment from our clinical experts to assist in reversing of poor posture. We have seen many kids, teenagers, and adults with back pain, neck pain, hip pain, knee pain and even slipped disc (slip-disc) that were related to poor posture. In the coming sections of this post, we will go over proper sitting, standing and sleeping posture. Please share this page with friends and family members. Let our non-surgical teams of experts provide you with the best posture correction with chiropractic treatment coupled through clinical physiotherapy and advanced technology. What is the Best Sitting Posture? No doubted about it, sitting is traumatic, but it can be minimized. Ideally, you will want to sit in a manner where your upper gluts (buttocks) is in contact with the back support of a chair, while the lumbar (low back spinal segments) avoids contact with the chair. If you can manage this, you will lessen the stress on your spinal discs and spine joints. If this is not possible, we will need to address the instabilities in your spine. Call us now for more information about our posture correction with chiropractic treatment. The absolute worse sitting position is one where you lean forward. 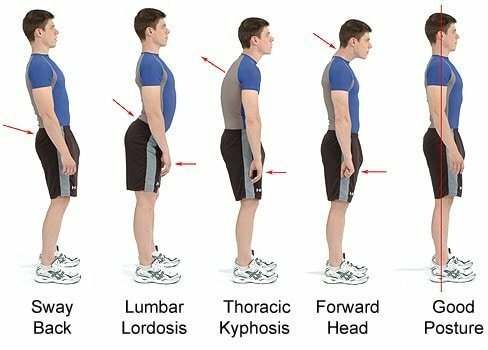 Leaning forward positions as seen while working on a desktop or laptops will cause the 4th and 5th segments in your lumbar spine to flex or change position. The flexion of these two segments will place enormous amounts of stress on spine joint and spinal discs. To understand this point better we need to elaborate on spinal disc pressure. Lead to Back Pain, Sciatica, and Slipped Disc? In short, those who lean forward while sitting have greater risks of developing degenerative disc changes, spinal disc bulges, and disc herniation. In other words, back pain. If you experience occasional or frequent back pain and your sit with a forward lean you increase your risks of getting severe forms of slipped discs known as spinal disc extrusion and disc fragmentation. Also, degenerative changes may develop in your ligaments and spinal joints. Ligamentum flavum hypertrophy is a common condition in individuals that sit for prolonged periods. Hypertrophy of ligamentum flavum is the main cause of spinal canal stenosis, sciatica, and weakness or pain in legs. Neglect often leads to spine surgery. Take our advice, correct your sitting posture before today for a healthy active life. An individual who experiences pain when coming up from a seated position has damage in joints, ligament, and spinal discs. Getting up in pain is the result of damage to multiple structures and tissues. The most notable source of pain upon standing is a facet pain or joint pain. Spinal joints or facets often undergo premature degenerative changes in individuals who sit for long periods. The severity could range from mild to severe. Surgeons recommend spine surgery for moderate to severe forms of facet joint degenerative changes or facet hypertrophy. Hypertrophy of facets is too common. We have treated thousands successfully. We have even managed to get severe cases of facet hypertrophy under control without spine surgery. Avoid ligament damage, slipped disc and even spine surgery. Call our main office at 03 2093 1000 for locations of our centers for posture correction with chiropractic treatment. Visit Malaysia’s best clinical teams of physiotherapists and chiropractors today. Take our Advice and CORRECT YOUR POSTURE! As you can see, poor posture has far-reaching consequences that you will not like! Correcting poor posture is critical to healthy living. So how do we define POSTURE? Posture is the way we sit, stand and even walk. It also refers to the position that our body holds throughout the day. However, there are those who are forced to sit or stand in poor postures because of pain they feel in joints or spine. To compensate for the pain, some walk, sit or stand or sit in the different angle to alleviate the pain. For example, when one sprains an ankle, they bear more weight on the opposite ankle to minimize weight bearing on the painful side. This compensated posture can cause more muscle imbalance, in the long run, leading to more pain and disability. If you find yourself constantly shitting or changing position due to pain, let our clinical non-surgical teams help you before spine surgery becomes your only option. In this fast-paced developing world, most of the people often reach for their computer mouse for their daily routine, particularly at their workplace. They often shrug their shoulders forward, and their arms are not in a neutral position. This hunched position can eventually lead to postural problems, which put our joints, muscle and other structures in PAIN. Don’t let poor posture cause health issues. Visit one of our centers for targeted posture corrections and specialized chiropractic treatments before serious health problems arise. Our clinical teams can help you towards a healthier more active life. Are you suffering from pain due to long hours of work? Do you notice any problem with your posture? Our clinical team of physiotherapists and chiropractors can help you. They are the ideal team to evaluate and perform posture correction with chiropractic treatment for a healthier more active life. So, if you live in Petaling Jaya, Kuala Lumpur, Shah Alam or Sungai Buloh, we have a center near you. For patients suffering from chronic pain, our primary objective is to reduce the pain. When the pain level is reduced, we then focus on restoring functions of the compensated muscles. Some of the muscle might have shortened causing tightness or weakness in that area. You should get your posture corrected before it causes pain. Chiropractic Specialty Center® offers the best posture correction with chiropractic treatment. In fact, our posture correction treatment program is not just through chiropractic, but also clinical physiotherapy and breakthrough therapeutic devices. Poor posture is a leading cause of pain as it damages the sensitive nerves, muscle, and ligaments. Neglect could lead to premature wear and tear. So, even if you don’t have pain, we can help correct your posture. You will start to look better, feel more confident and of course, avoid any future pain. Don’t let poor posture be the cause of your pain or even disability. Let us help you live a well-balanced life! Even if you have a slip-disc, we can help. Our methods of care are through clinical research-based methods of NSD Therapy®. NSD Therapy® is the most advanced form of spine care that targets all root-causes. In short, we can heal your back and improve your poor posture. Postural problems are prevalent among people all walks of life, and we are here to help you. With the right treatment plan incorporating both physiotherapy and chiropractic, you can stand, walk, sit comfortably and enjoy the best moments of your life. Call or visit us today for posture correction with chiropractic treatment today.